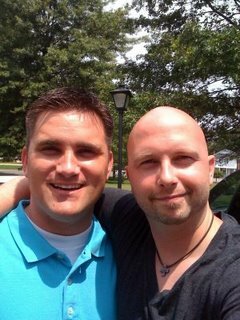 After 6 years without seeing each other face-to-face, my dear friend Nathan Gaddis dropped by today for a visit. He is from Campbellsville and was in town preparing for a Canadian camping trip with his dad. A cup of coffee, a quick lunch, and 5 hours later, we were still talking about life, ministry, parenting, blogging and today’s church culture. It was like time had stood still and we were back in our dorm room thinking about our future careers. Nate and I met in 1996 when we were roommates at CU. He only stayed for a year, but our friendship continued as he moved to Nashville to finish school at Belmont University. Since then we have talked on the phone, on fantasy football, and occassionly met up whenever, and wherever, we could. TX. He also encouraged me to join other creative arts people in learning about the use of art in modern worship environments. He is a class act in walks of life: his songwriting, his worship leading, and musicianship. But most of all, he is a brother in Christ who loves the Lord and his family deeply. That is what really makes him stand out amongst the crowd. Nate, great to see you man! Happy camping. Watch out for the poison ivy. And I look forward to many more years of lasting friendship.